There’s been a lot in the news lately about state employees in Wisconsin protesting the attacks on their rights and their livelihoods. I posted about it here a week ago. Many of those protesters are teachers, K-12 as well as higher ed, and (at least as importantly, I think) their students. 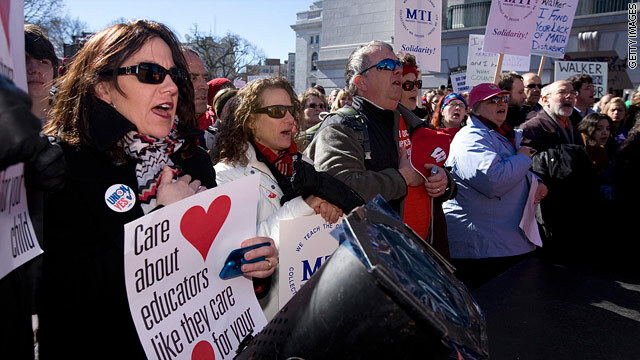 These protesters, many of them teachers, have been braving long nights and bitter days, stubborn resistance from blind legislators and angry retorts from a smaller crowd of counter-demonstrators. These protesters, many of them teachers, have crowded together shoulder to shoulder, heels on top of toes, inside the state capitol building; and they huddled together in the freezing sleet and dark winter streets. Where do they find the strength? Well, in the case of the teachers, they’ve been facing this and worse for ages, often from their own neighbors, friends, family members, even the parents of their students. They’ve been facing down ignorance and prejudice for longer than any of us would care to admit. They’ve done so with a fortitude that is hard to fathom. And they do it for a pittance. Why put themselves through all this for the little reward our society is willing to give them? You can find the text for this poem on Mali’s website.